The DoorKnob Condition Ensures Privacy | OhGizmo! While there are several unofficial methods for letting a roommate know you’d like a little privacy the Doorknob Condition by designer Arnaud Lapierre ensures you won’t be interrupted no matter what. Instead of hanging something on the handle which could be misinterpreted you simply pull on the doorknob on the inside of the room which causes the knob on the outside to recess to the point where it can’t be grabbed or turned. In theory it could also work well in a hotel when you don’t want to be disturbed in the morning as opposed to those hanging doorknob signs which are so easy to remove by a hilarious prankster outside your room. What is the slot for? Couldn’t your roommate pull the knob his direction preventing your exit? Can it be forced open should there be an emergency? Um, the link isn’t working btw. This will not work on any door-knob I’ve ever seen in my 1/2 century of living. Any door-knob that allows that to happen – as you described – is a security risk for both the person on the inside as well as the person on the outside. small suction cup/pad would allow you to pull it back out. Kouroth & Mike are knobs. What a brilliant idea! the knob on the inside just needs to be longer so it won’t get recessed, quite simple if you think about it. Also Mike, why is it any more of a security risk than a locked door? Stop spewing clap-trap. Simple.. put a small button/switch on the inside which has to be pushed while pulling the knob in. The slot is most likely a way of getting the door knob back out or opening the door as such would be needed. Well it was definitely conceived by a design student and not an engineer, but it is fairly good looking. As a home builder I can say that this door would be no more difficult to break through than with an average key set. Doors for the most part only give the illusion of security. Most of the composite framed doors used fracture fairly easily. The simplest security for most residential doors is a metal bar (or dead bolt) in to a reinforced door jamb. If your just in a pine 2×4 or 2×6 (like 95% + of you are) most strong 14 year olds boys would be able to kick your door open. If they really want in they could use a window or if really dedicated they could fairly easily come through the roof (on houses with burglar bars). The best security is not to show your wealth, and be a difficult target. Thieves, by their very nature, do not like to work. Make it easier, and more lucrative, to rob a neighbors house. Not yours. You are all missing the point here. This is for an interior room. you can’t pull it from the other side on the one. and for a hotel this would be prefect. Yes in theory it could be pulled or pried out but that is a lot of work and it is to show you don’t want to be disturbed. It is not to prevent someone from entering. Could the knob be pulled out from the outside? No, it would only work in one direction – it would be too difficult to make it bidirectional. Could a person push it from the outside? It could be easily designed to only slide when the inside knob is being pulled. Safety hazard? Well, kinda. Having a knob on a locked door to force yourself in helps, but a quality knob on a quality door is impossible to open with human force. It could be designed to be opened with a pin like most bathroom doorknobs, or a larger hole something like a pen could fit in. This device would only be useful for an interior knob around people you trust. As a hotel knob, it would require a slot like the one pictured a universal key could open. I wish people would think before they write in a forum. Security risk? Do you think a bathroom lock is a security risk? Please think about it. Pushed in from the outside? Possibly if designed poorly, but can easily be made not to with a simple button latch that has to be pressed in before it can be pulled. Yes, obviously this is an interior/hotel door. Regardless I could break into any interior or exterior door that Home Depot sells if I had on a sturdy shoe. This is just a slick and more complicated way of a bathroom knob’s lock. In one you press a button and the knob is inoperable, and in the other you pull so that the knob is inoperable. If you want the poor man’s version of this go to a hardware store and buy a $10 bathroom door knob set and install it. Then when your roommate tries to open the door and it won’t turn, he/she will get the point. The simple solution to this is have a lock on the door. This means handle or no handle, your pesky roomate wont be getting in. It has the “cool” factor but it is pretty pointless. This is very good way to tell any body about privacy condition.But i was not knowing about this.Thanks for telling, At least from know i will not disturb anybody. This is really very good way to convey about privacy condition.But i was not knowing about this.Thanks for telling ,atleast from know i m not going to disturb anybody. A standard knob has two function: knob and handle. 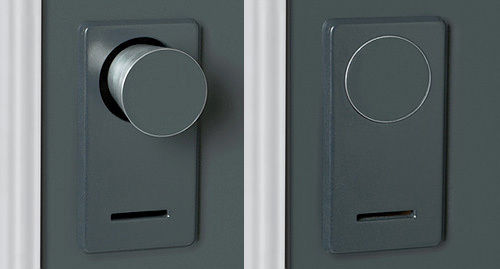 This design needs to allow for the use of the knob as a handle without necessarily locking the door. You people are amazing. This is a brilliant design which, with a look inside the enclosure may in fact reveal engineering addressing all your concerns. Moreover, privacy, not security is the issue meant to be addressed here. I’m sure a decent battering ram would suffice to shatter anyone’s security as well as privacy given proper motivation. Pedantic. if it is longer on the inside, imagine the length of a door stopper required to keep the knob from smashing into a wall.